Trans-Asian Axis - Re: War With China? WASHINGTON (Sputnik) - US Secretary of State Mike Pompeo and Secretary of Defense James Mattis during talks with Chinese officials said the United States wants Beijing to withdraw its missiles from the Spratly islands in the South China Sea, the State Department said in a press release. "The United States called on China to withdraw its missile systems from disputed features in the Spratly Islands, and reaffirmed that all countries should avoid addressing disputes through coercion or intimidation," the release said after Pompeo and Mattis met with Chinese diplomats and security officials at the State Department. Earlier, Chinese Foreign Affairs Director Yang Jiechi, alongside Pompeo and Mattis at a joint press conference, said the situation in the South China Sea is moving "toward greater stability." According to the release, both countries during the talks, the second US-China Diplomatic and Security Dialogue, agreed to support a peaceful resolution of disputes, overflight issues and other lawful uses of the sea in the region. In May, Mattis said that despite Chinese President Xi Jinping’s pledge not to militarize the Spratly Islands, Beijing had moved weapons there. In turn, Beijing said that it had the sovereign right to send troops to any part of its territory. The Asia-Pacific region has several territorial disputes in the South China and East China seas that involve Brunei, China, Japan, Malaysia, the Philippines, Taiwan, and Vietnam. 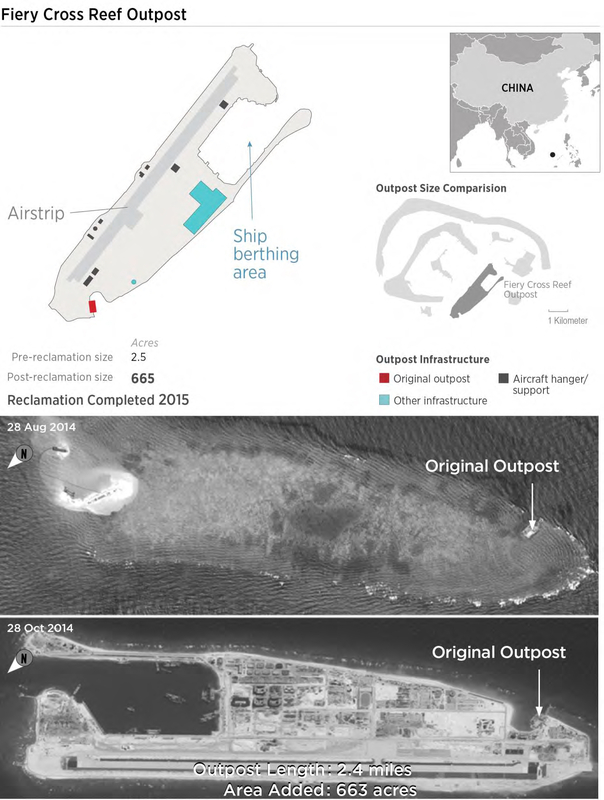 Beijing considers the Spratly archipelago as its territory, although a Hague-based court concluded that there was no legal basis for China's maritime claims. US think tanks and the Pentagon have underestimated the number of Chinese nuclear submarines under construction, a new analysis suggests. Pictures taken of the Bohai Shipyard and Longpo Naval Facility show that China has more nuclear attack subs in development than previously believed, Defense One reported Tuesday. The report said there is one extra submarine under construction that the Pentagon previously did not account for. Nevertheless, there are fewer operational nuclear subs than Western institutions believed, namely the US Department of Defense and the Center for Strategic and International Studies (CSIS), the report says. CSIS and Pentagon estimates of China's ocean-going nuclear force pegged the number of operational Jin- or 094-class submarines at four. Yet two of these underwater boats "appear not to be in operation," said Catherine Dill of the James Martin Center of Nonproliferation Studies at the Middlebury Institute of International Studies at Monterey, as quoted by Defense One. Notably, the Pentagon's 2018 China Military Report and CSIS' China Power group both stated that four 094-class submarines are active. By comparison, Russian nuclear forces feature nine strategic nuclear submarines "that provide continuous military patrols in the sea," Russian Defense Minister Sergei Shoigu said in May 2017, Sputnik reported. "The Russian Navy is also planning to increase the number of strategic nuclear submarines to 13, including seven ‘Boreys' with ‘Bulava' missiles," he said. The US nuclear-armed submarine fleet features 14 Ohio-class submarines, which are comparable in size to Russia's Borey-class and China's 094-class subs. The South China Sea is a powder keg, and one senior Chinese military officer seems interested in lighting the fuse even further. Dai Xu, a People’s Liberation Army Air Force (PLAAF) senior colonel and president of the Institute of Marine Safety and Cooperation, suggested last weekend that the Chinese navy use force to counter US freedom-of-navigation operations in the South China Sea, Taiwan News reported Sunday. He spoke at a conference hosted by the nationalist, state-backed Chinese tabloid Global Times. Dai, famous for his hawkish rhetoric, argued that U.S. Navy freedom-of-navigation operations, or FONOPS, are provocations aimed at undermining China’s sovereignty rather than an actual attempt to ensure freedom of navigation in international waters. The U.S. Navy regularly sails destroyers and cruisers past Chinese-occupied territories in the South China Sea, while U.S. Air Force bombers tear past on routine overflights that often ruffle Beijing’s feathers. The most recent FONOP occurred in late November when the U.S. Navy sent the Ticonderoga-class guided-missile cruiser USS Chancellorsville to challenge Chinese claims near the Paracel Islands. The Global Times is known for its often provocative articles, intentionally designed to appeal to an alternative audience and differ from the more rigid state media outlets like Xinhua. Dai’s rhetoric at the conference is consistent with that trend, as he seemed to welcome an increase in tension, suggesting that confrontation in the South China Sea could create an opportunity for mainland China to retake Taiwan. Dai’s comments about the use of force in the South China Sea comes on the heels of a near-miss incident that occurred in September when a Chinese Luyang-class destroyer confronted the Arleigh Burke-class guided-missile destroyer USS Decatur during a FONOP in the Spratly Islands. Is China Preparing for WAR Against US? BEIJING, China – The biggest source of tension in relations between Beijing and Washington is the question of free navigation in the South China Sea and the status of Taiwan. These are the two main reasons that could trigger an armed confrontation between China and the United States, according to experts. Chinese President Xi Jinping has ordered the country’s military to accelerate its training and prepare for a possible war, the South China Morning Post reported. “All military units must correctly understand major national security and development trends, and strengthen their sense of unexpected hardship, crisis and battle,” said the country’s leader during a meeting with the administration of the Chinese Central Military Commission. Xi Jinping seeks to increase the Chinese Army’s defensive capability since the start of its warrant in 2012. The issue highlights that in 2019, the Chinese leader plans to step up activities in this direction. Earlier, the Chinese military newspaper also warned troops to prepare for war . The main areas of potential conflict are the South China Sea and Taiwan, which the Asian giant considers as its rebel province, which should rejoin Beijing. The United States represents an opponent for Beijing in both areas. Washington insists on free navigation in the waters of the South China Sea, which would imply the possibility of carrying out patrol missions in the area. In addition, the US expresses its support for Taiwan and opposes Beijing’s territorial claims. On the island there is no US embassy, ​​however, the American Institute in Taiwan (AIT), in fact, carries out embassy functions. In October 2018, two US Navy ships crossed the Taiwan Straits, causing concern to China. At the same time, AIT director William Brent Christensen pointed out that any attempt to determine Taiwan’s future with non-peaceful means poses a threat to regional security and warned that the US will not allow that to happen. Meanwhile, retired Chinese People’s Liberation Army (FARC) Colonel Yue Gang has suggested that the US does nothing more than seek pressure on Beijing in the context of the Sino-US trade war. China claims to have deployed missiles "capable of targeting medium and large ships" days after the latest US Navy "freedom of navigation" operation near contested islands in the South China Sea, state media announced. 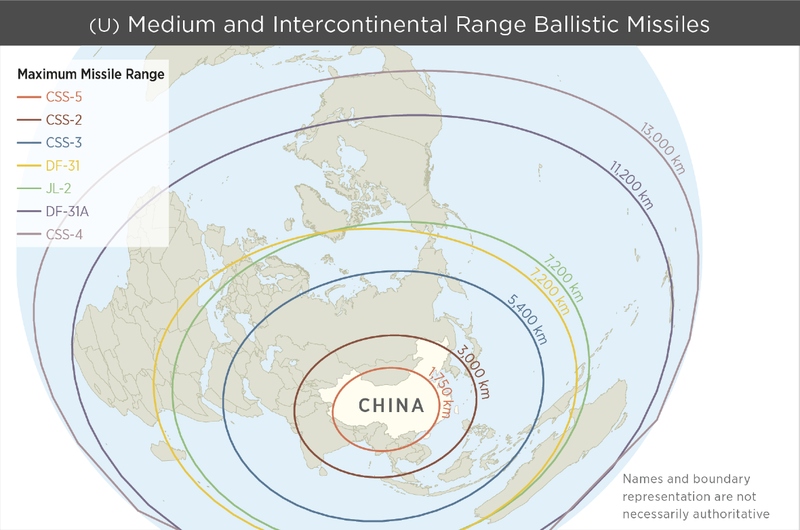 The deployment of the DF-26 ballistic missiles in China's remote northwest plateau, originally announced Tuesday on China Central Television, follows a mission from the US guided-missile destroyer USS McCampbell, which steamed close to the Paracel Islands, the previous day. Capable of hitting targets 3,400 miles (5,471 kilometers) away with nuclear or conventional warheads, the DF-26 was dubbed the "Guam killer" by analysts at the time because it would allow China to bring unprecedented firepower to the US island territory -- home to Andersen Air Force Base and other key US military installations. The 1.3 million-square-mile South China Sea has seen increasing tension in recent years, with China aggressively asserting its stake amid conflicting claims from several Southeast Asian nations. "McCampbell sailed within 12 nautical miles of the Paracel Islands to challenge excessive maritime claims and preserve access to the waterways as governed by international law," US Pacific Fleet spokesperson Lt. j.g. Rachel McMarr said in a statement. China accused the US of trespassing into its territorial waters. "The US action violated the Chinese laws and international laws, infringed China's sovereignty, damaged regional peace, security, and order," Foreign Ministry spokesperson Lu Kang said on Monday. "China will take necessary actions to protect state sovereignty." Citing an anonymous expert, the Global Times said the DF-26 missile mobilization "is a good reminder that China is capable of safeguarding its territory." Beijing has built fortifications on contested islands, landed long-range bombers and last year President Xi Jinping, who claims the area has been Chinese territory since "ancient times," oversaw China's largest-ever naval parade there. The DF-26 missile system originally entered active service in the People's Liberation Army Rocket Forces last April. It was unveiled during a military parade in 2015 in Beijing in 2015. "Foremost among China's military assets capable of reaching Guam, the DF-26 IRBM represents the culmination of decades of advancements to China's conventional ballistic missile forces," a 2016 report from the US-China Economic and Security Review Commission said. According to a report from the Missile Defense Project at the Center for Strategic and International Studies, China may have an anti-ship version of the DF-26 under development -- and may have even tested it in 2017. Tuesday's Global Times report, citing an unnamed expert, said the DF-26 was deployed in China's northwest as it was protected from opposing anti-missile forces in that area. Despite Chinese warnings, the US is unlikely to stop challenging Beijing's claims in the South China Sea. Washington says China's construction and fortification of man-made islands puts trillions of dollars of trade, travel and communications under the thumb of Beijing. "The Trump administration is not going to back off in the face of Chinese pressure," Malcolm Davis, a senior analyst in defense strategy and capability at the Australian Strategic Policy Institute in Canberra, told CNN in December. Any US withdrawal would "severely undermine (US) credibility and encourage the Chinese to be more assertive and bold," he added. The McCampbell's "freedom of navigation" operation on Monday was the US Navy's first of 2019. Analysts said the US performed one about every eight weeks last year. One operation almost resulted in a collision between a US destroyer, the USS Decatur, and the Chinese one that challenged it, the Lanzhou, in September. The two vessels came within 45 yards (41 meters) of each other near the contested Spratly Islands, with the US Navy saying at the time that the Chinese warship "conducted a series of increasingly aggressive maneuvers accompanied by warnings for Decatur to depart the area." After the incident, some pro-Beijing commentators called for China's navy to go even further. "If a US warship illegally enters into Chinese territorial waters again, two Chinese warships should be sent, one to stop it and the other to bump against and sink it," Dai Xu, president of China's Institute of Marine Safety and Cooperation, was quoted as saying in an article on the Chinese military's English-language website. Meanwhile, President Xi reportedly started 2019 by ordering the country's military to enhance combat readiness. Speaking at a meeting of the Central Military Commission in Beijing on January 4, Xi said the PLA should "upgrade commanding capability of joint operations, foster new combat forces, and improve military training under combat conditions," according to a state media report. China has activated its "ship killer" Dong Feng ballistic missiles after a US navy ship traveled within 12 nautical miles of the Parcel Islands "to challenge excessive maritime claims and preserve access to the waterways as governed by international law," according to a US Pacific Fleet Spokesman. In the 1990s, China laid claim to all of the Parcel Islands using a straight baseline around the entire archipelago, which it has labeled the Xisha Islands. The boundary is not recognized by international maritime law, while Vietnam and Taiwan have also laid claim to the islands. The USS McCampbell (DDG-85) passed by the disputed island on Monday, during which "The Chinese side immediately sent military vessel and aircraft," according to China's Foreign Ministry Spokesman, Lu Kang, adding that they warned the ship to leave." The deployment of the DF-26 missiles was reported by China's state-controlled Global Times, which tweeted a montage of brave and loyal Chinese servicemen driving Xi's Dongs to various locations in China set to the theme song of your average 1990s action movie. The missiles will not be positioned near the Taiwan Strait or the actual disputed islands - instead, the truck-mounted weapons have been sent to China's more remote plateau and desert areas. "A mobile missile launch from deep in the country’s interior is more difficult to intercept," said an expert quoted by the Global Times, who claimed that the DF-26 has a range of 4500km, more than enough to cover the entire South China Sea. "The DF-26 is China’s new generation of intermediate-range ballistic missile capable of targeting medium and large ships at sea," warned the Times," adding "It can carry both conventional and nuclear warheads." "During the initial phase of a ballistic missile launch, the missile is relatively slow and not difficult to detect, making it an easier target for enemy antimissile installations. After the missile enters a later stage, its speed is so high that chances for interception are significantly lower," reads the report - which points out that it could hit a US naval base in Guam - located in the middle of the Pacific. "The report is a good reminder that China is capable of safeguarding its territory," reads the report. Another video of the DF-21D set to yet more action movie music shows a CGI simulation of the Dong-Feng unsheathing at high altitude before its warhead reenters the earth's atmosphere and decimates a fleet of ships with what appears to be a nuclear blast. The US Navy's territorial test came weeks after Australian media published details from a speech by one of China's leading military commanders where he recommended sinking two US aircraft carriers to resolve the ongoing territorial dispute. During a wide-ranging speech on the state of Sino-US relations, Rear Admiral Lou Yuan told a Shenzhen audience that the current trade spat was 'definitely not simply friction over economics and trade," but a "prime strategic issue." Beijing has become more aggressive in recent years over the disputed islands - asserting sovereignty over the entirety of the South and East China seas despite an international arbitration court rejecting their claim, according to News.com.au. International law also prohibits Beijing to enforce territorial rights to the waters around artificial islands - which China has recently built on what was previously coral reefs. China has demanded that all nations respect a 12 nautical mile (22km) boundary around them. "We will continue to take necessary measures to safeguard national sovereignty and security," said Foreign Ministry spokesman Lu.